This month our newsletter is about two of our specialized services – Dry eyes and Low Vision. If you or a loved one is suffering from dry, teary eyes the Ziena Eyewear range is definitely for you. Whether you’re male or female, allergies and dry eye show no bias. During all four seasons, don’t let allergies stop you from enjoying nature’s beauty. De Jongh Optometry is now a proud stockist of Ziena Eyewear. Clear prescription lenses and sunglass prescription lenses can be fitted in these frames which offers you a stylish look while protecting your eyes. Relieve dry eyes syndrome naturally with Ziena. Ziena’s silicone shield locks in eye moisture while blocking out wind & airborne irritants like dust & pollen. It is specifically designed to alleviate symptoms of dry eyes, hay fever and bell’s palsy. It is proven as a noninvasive (no surgery, natural) solution to ailments. Ziena eyewear helps relieve the burning, itching and redness caused by dry eye, without side effects or reactions with other medications or treatments. Do you or a loved one suffer from Low Vision? Deidre de Jongh & Carina Janzen and will determine the right types of devices that will help you with the everyday tasks you want to perform. They may recommend starting with one or two devices to see how you manage, and then adding additional devices as you become used to working with the devices you have. 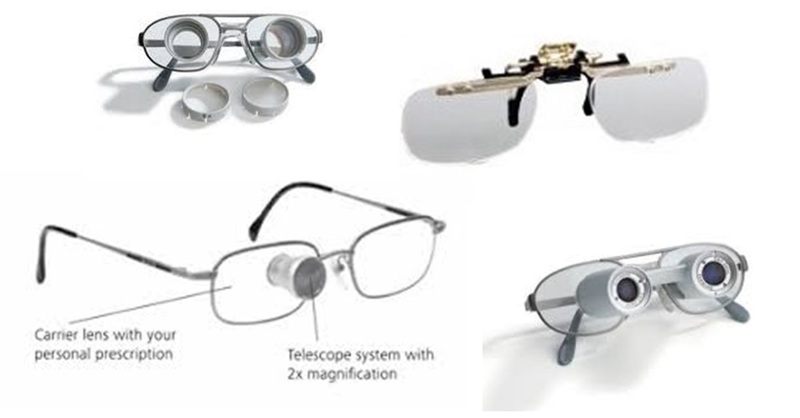 Low vision optical devices include a variety of devices, such as stand and hand-held magnifiers, strong magnifying reading glasses, loupes, and small telescopes. Because these devices can provide greatly increased magnification powers and prescription strengths, along with higher-quality optics (i.e., the way the lens bends or refracts light), they are different from regular glasses and commercially available magnifiers. Low vision optical devices are task-specific. You can think of them as being similar to “tools” that are used to build a house—different tools for different tasks. Therefore, your eye doctor may prescribe several different low vision optical devices for various tasks: One or two devices for reading, another for watching television and seeing faces, another for seeing the computer screen, and yet another for sewing. We may also recommend sunglasses to reduce glare, protect your eyes from ultraviolet (UV) and blue light, and enhance your ability to see more clearly in different lighting conditions. It is extremely helpful to both you and your optometrist if you can make a list of the tasks or activities that are most important to you and share that information with him or her when you have a low vision eye exam. It’s also helpful to bring along samples of your everyday tasks, such as mail, bills, or needlework. The low vision service is incomplete unless you’ve been taught how to use the devices that have been prescribed for you. After you’ve been prescribed low vision devices, such as a magnifier or telescopic glasses, it’s important to learn how to use them when you get home. Understand the potential and limitations of the device. You may find that using low vision optical devices effectively is different from what you have been used to in the past, when a single pair of glasses did everything—helping you to see at distance, intermediate, and up close. Many persons with low vision can have 4-5 different devices to help with a range of everyday tasks. Book your comprehensive eye examination, Low Vision Assessment or Dry Eye Assessment today. Phone us on 012 998 7592/3 or book online http://www.dejonghoptometry.co.za.